Top Five Offensive Players Per Position Heading in to the 2017 season. Here are the top five players per position on the offensive side of the ball. I realize this is way too early for the NFL draft, but many people like to follow the college season. This list is at least a start to the draft process. 1-Sam Darnold, USC- The closest to a sure thing to come out since Andrew Luck. 2-Josh Allen, Wyoming- High upside. Could be the next Derek Carr. 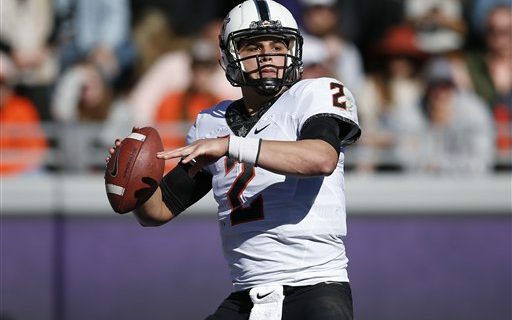 3-Mason Rudolph, Oklahoma State- Pure pocket passer. Love this guy. 4-Josh Rosen, UCLA- Coming off shoulder injury. Leadership questions. 5-Lamar Jackson, Louisville- Next Michael Vick? Can throw the ball 90 yards. 1-Saquon Barkley, Penn St- Barkley and Guice could go either way. 2-Derius Guice, LSU -At this point Barkley and he have separated themselves from the rest of the class. 3-Royce Freeman, Oregon -Big back with big play ability. 4-Ronald Jones, USC -Extremely fast. Not an every down back, only 195 lbs. 5-Sony Michel, Georgia- Better prospect than teammate Nick Chubb in my eyes. 1-Calvin Ridley, Alabama- Challenged Braves mascot “The Freeze” to a race. 2-Courtland Sutton, SMU- Looks like a NFL veteran receiver already. 3-Dante Pettis, Washington- Great punt returner, best route runner. 4-Christian Kirk, Texas A&M- Lacks top end speed, but very productive. 5-James Washington, Oklahoma State- Fun year in Stillwater with him Mason Rudolph throwing to him. 1-Mark Andrews, Oklahoma- Think Jordan Reed, more of a WR. 2-Troy Fumagali, Wisconsin- Reliable hands and great blocker. 3-Adam Breneman, Umass- Transfer from Penn State. 4-Mike Gesicki, Penn State- Two average years, then a break out last year. 5-Dalton Schultz, Stanford- Zero drops so far in his career. 1-Mike McGlinchey, ND-Played both RT and LT. He has good fundamentals. 2-Connor Williams, Texas- Started every game since walking onto campus. 3-Orlando Brown, Oklahoma- 6’8 340 buries you in the run game, Barry Switzer would be proud. 4-Mitch Hyatt, Clemson- Handled Alabama speed rushers well in the Championship game. 5-Trey Adams, Washington- High upside. Huskies loaded this year. 1-Quenton Nelson, Notre Dame- May be best lineman in the draft. 2-Billy Price, Ohio State -Can play guard or Center. 3-Mason Cole, Michigan- QB of the Wolverines line. 4-Tyrone Crowder, Clemson- Looks like Gabe Jackson of the Raiders. 5-Larry Allen Jr, Harvard- If he’s half as good as his father……..